Lori Boccuzzi speaks about her faith journey and the challenge of engaging Millennial Catholics through new technology. 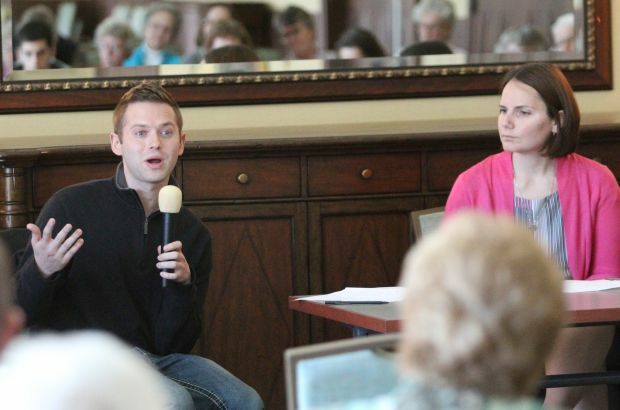 Catholic young adults had a forum to discuss what they see as the significant issues within the church April 6 at Chestnut Hill College. 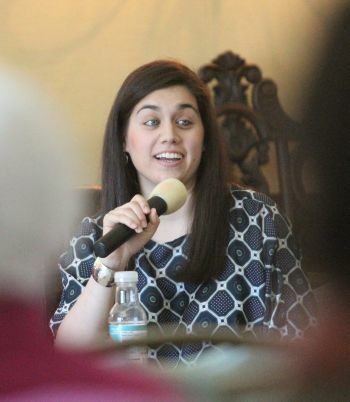 The college’s Institute for Forgiveness and Reconciliation held the “Conversation that Matters: Young Adult Catholics Address the Church that They Love,” featuring a panel made up of three young people, all graduates of the college on the western edge of Philadelphia. The panel consisted of Lori Boccuzzi, director of Pathways to Success in College at Cristo Rey Philadelphia Catholic High School; Michelle Lesher, who joined the Sisters of St. Joseph of Philadelphia, the order of religious sisters that sponsors the college and who remained there to teach and now works as the assistant director of campus ministry; and Seth Jacobson, a doctoral candidate studying educational leadership and policy at Drexel University. They shared their personal experiences growing up in different environments but all ended up at the same place: the Catholic Church. She recalled how a book of daily poems included one on her birthday that always stuck with her. Lesher spoke of her growing up in a “beautiful parish faith community and a girl’s Catholic high school” where she participated in the Community Service Corps (CSC), an organization which enables teens to put their faith into action through service opportunities. “At the end of every Mass, Father would say something that always stood out to me: ‘The Mass never ends but must be lived. Let us go forth and serve our brothers and sisters,’” Lesher said. 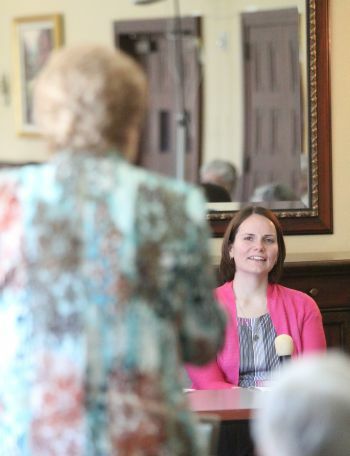 Panelist Michelle Lesher listens to a question from an audience member during the discussion. In contrast, Jacobson elaborated on his non-religious childhood in Philadelphia. “It was clear to us kids,” he said, “that the church was something oppressive and stagnant. I knew that I was gay but I was scared of what God would feel even though I didn’t really understand what God was then. I did not address my problems and it became overwhelming. The conversation then turned into discussion among the 30 guests about evangelization and how younger generations are using technology. Boccuzzi spoke about how young adult Catholics known as Generation Y, or Millennials, (born 1980-1994) differ from slightly older young adults of Generation X (born 1965-1980). “The Millennials live in a very real but virtual community,” she said. “It feels like the real world, but it’s fake. They are denying their authentic self. Bishop Timothy C. Senior (shown in mirror), rector of St. Charles Borromeo Seminary, asks the young adult panelists a question. Jacobson said he started a young adult Catholic community and at its meetings, “we had an open dialogue about the church, where we could celebrate it and critique it where it needed to be. After the panel dialogue closed audience members posed questions and made comments. In attendance were many Sisters of St. Joseph and Chestnut Hill College leaders, as well as Bishop Timothy C. Senior, rector of St. Charles Borromeo Seminary. She said no previous Chestnut Hill speaker forums had so focused on the issues of young people. “We are open to promote conversations on any significant topic pertaining to the life and mission of the church and the well-being of our society as the ‘world that God so loves,’” she said, referencing the Gospel of John, 3:16. 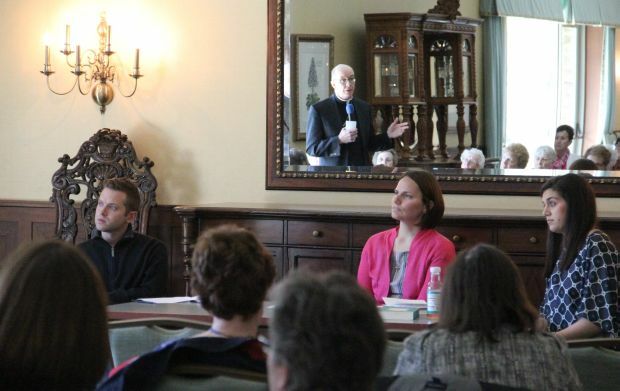 Chestnut Hill College’s Institute for Forgiveness and Reconciliation hosted the panel forum April 6.